Cameron Bucher follows through on her forehand shot for Miami Trace during a Frontier Athletic Conference match against Hillsboro on the courts at Miami Trace Tuesday, Sept. 11, 2018. 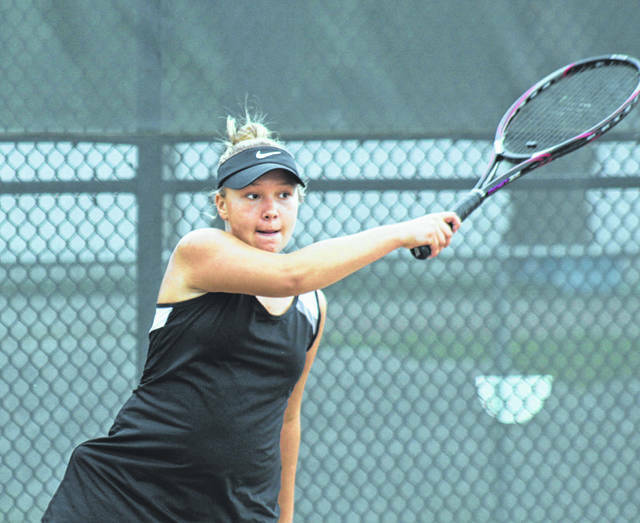 The Miami Trace Lady Panther tennis team made it back-to-back wins Wednesday with a 5-0 decision over the visiting Astros of East Clinton High School just a day after beating conference opponent Hillsboro. At first singles, Anita Pursell defeated Haley Harrell in what proved to be the toughest match of day, 6-4, 7-5 (7-3). At second singles, Bayley Thompson beat Alexia Garen, 6-0, 6-0. At third singles, Cameron Bucher blanked Melina Noble, 6-0, 6-0. First doubles saw Haiven Pepper and Kyeigh Slone beat Paige Harrell and Carlie Ellis, 6-2, 6-1. At second doubles, Beth Hogsett and Hannah Clemons defeated Erin Kratzer and Sarah Ross, 6-1, 6-1. Miami Trace will play a return match at East Clinton Tuesday at 4:30 p.m.